Freddy Krueger Candy Holder.Includes: One Freddy Krueger Candy Holder with Bowl. Dimensions: Approximately 20" Tall. *Candy Not Included. Accessories Sold Separately. This Freddy Krueger candy holder is made of out hard poly foam. Back is flat and hollow. Comes with clear plastic bowl. Stands 20" tall. Put the star of Nightmare on Elm Street movies on your doorstep! 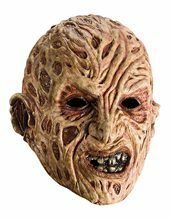 Deluxe Freddy Krueger Latex Adult Mask.Includes: One Freddy Krueger Latex Adult Mask.Available Size: One Size Fits Most Adults and Teens. *Costume and Accessories Not Included. Sold Separately. 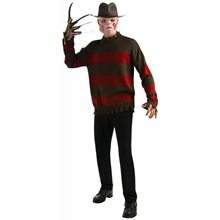 Features one super deluxe latex overhead a nightmare on elm street 2010 freddy costume mask. Freddy Foam Latex Mask;Freddy Nightmare on Elm Street Deluxe Foam Latex Mask Brand new! Officially licensed! Perfect for Halloween and costume parties! 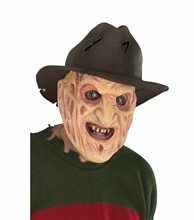 Includes: Freddy foam latex mask Actually moves with your face for a creepy, authentic look! Text on back of box: "This foam latex mask of New Line Cine'a infamous gloved slasher, Freddy Krueger is of a unique foam latex construction which actually moves as your face moves. Use the included face form to display and preserve the appearance of this truly remarkable creation for years to come". 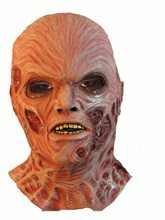 Freddy Krueger Foam Latex Adult Mask.Includes: One Freddy Krueger Foam Latex Adult Mask.Available Size: One Size Fits Most Adults and Teens. *Costume and Accessories Not Included. Sold Separately. Features this immortal villain of elm street and beyond. Adult size freddy halloween mask. The perfect addition to your Freddy costume!